I have been working on this slideshow for a while now and finally put the finishing touches on it tonight. It contains some of my photos many of the talented Jesse Michener's photos, who also happens to be a co-creator of this amazing workshop, WRITE: Doe Bay. My original post on this writing retreat can be seen here. This slideshow, along with the beautiful song, "The Acrobat", written and performed by Matt Brown and the Connection, pretty much sum up the feeling's I took away with me. WRITE Doe Bay Spring 2014 from WA Nutting on Vimeo. Strawberry Season is here, yay! I love strawberry season it reminds me that even though the clouds are looming it is indeed summer and I better get to enjoying it because, in Seattle, the weather can turn on you in a flash. So I look forward to things that remind me of summer and strawberry season always prompts me to savor all the sweetness this season delivers. I have professed, in the past, I am not a jam maker but that does not stop me from picking a farm tote or two, full to the brim, of these vine ripened ruby gems. And every time I am at the berry farm to pick, I am asked by other pickers and often the cashier if I make jam. A somber "No", is always my reply and it seems to be met with a bit of disappointment. And with an heavy eleven pounds of sweet berries they just can't help but reply, "Well, what do you do with them?" And sometimes I feel a bit of shame as so many pickers are jam makers. I always feel a bit less than for just a moment until I start rattling off my sweet plans for my own strawberry haul. "Well we eat them fresh, we use them in smoothies, salads, I make lemonade ice cubes, and I make this amazing strawberry cake that is incredibly delicious". Their eyes a bit more intrigued and then all of a sudden the shame is lifted as I describe, my cake. Well, it's actually Deb from Smitten Kitchen's cake but hey I am the one making it here and I must admit, as I describe the "puddles of jam" and the "dimpling batter", I own this cake. I always give her credit but my enthusiasm as I share her recipe feels as if it were my own discovery. Deb's blog Smitten Kitchen is one of my all time favorites and I gladly sing her scrumptious praises. But let's get back to this cake because this faintly sweet, delicately crisp cake that buckles around the berries like a country quilt is freaking amazing. 3/4 cup plus 2 tablespoons granulated sugar, the original recipe calls for a cup of sugar plus 2 tablespoons but I cut ¼ out and thought it worked perfect. 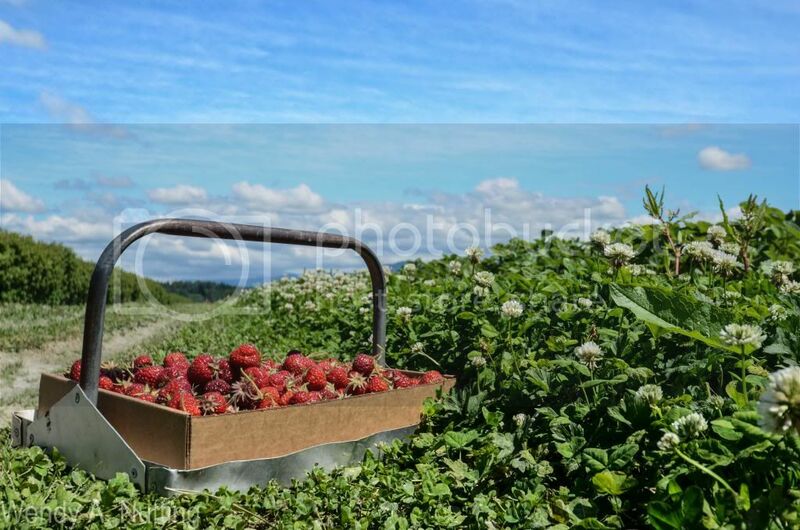 1 pound farm fresh, just picked strawberries, hulled and halved, store bought berries will not yield the correct results, consider yourself warned. Preheat oven to 350°F. Butter a 10-inch pie pan or 9-inch deep-dish pie pan. I also have also done this in a 9X13 pan and I used one and a half times the recipe. Pour into prepared pie plate. Arrange strawberries, cut side down, on top of batter, as closely as possible in a single layer, and yes, I had to squeeze the last few berries in. 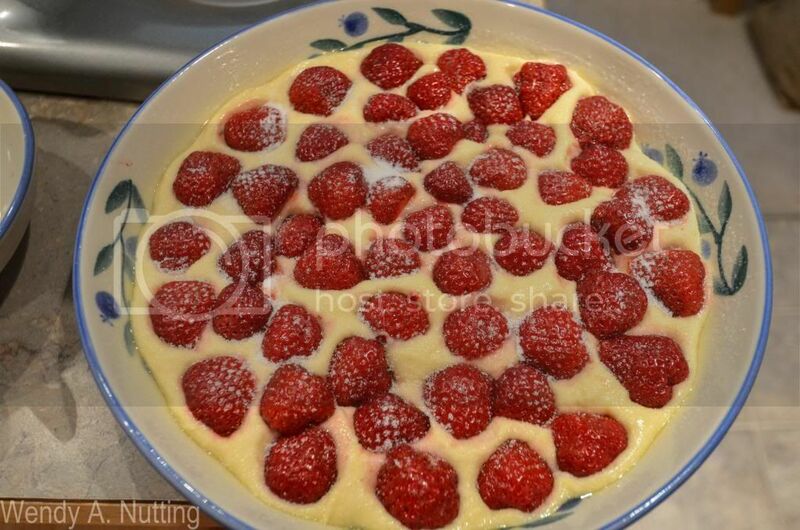 Sprinkle remaining 2 tablespoons sugar over berries. Bake cake for 10 minutes then reduce oven temperature to 325°F and bake cake until golden brown and a tester comes out free of wet batter, about 50 minutes to 60 minutes. 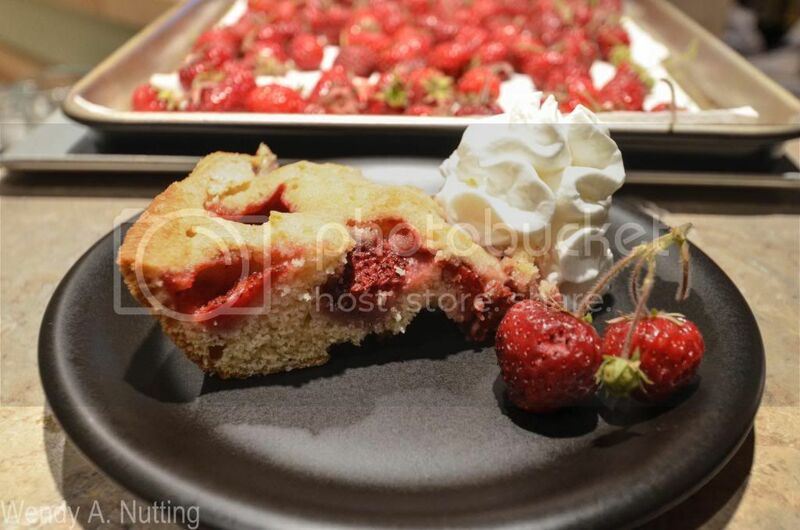 (Gooey strawberries on the tester are a given.) Let cool in pan on a rack. Cut into wedges. Serve with homemade whipped cream. This year I made two and froze one. I will update later on how that worked out. Deb says it will be fine on the counter for two days but good luck with that. I shared this with a gal last year at the berry farm and Shannon left me this comment on my blog post the very next day, "I heart you!!! Bumping into you at the berry farm this morning ended up being heaven to my taste buds. I made your cake and it was devoured in seconds. The second one is in the oven. I did make jam too but the strawberry cake(s) > jam. Thank you!!" ...and a special thanks to the Biringer Farm, that's where I pick and their berries are the best! Enjoy and let me know if you try it and what you think, we think it' a keeper.